High Court rules in favour of ASA for use of fibre in advertising. Cityfibre has lost it's case against ASA over the judicial review of the term 'fibre' used in advertising. It was determined that ‘fibre’ was not identified as a differentiator when choosing a broadband package; and was usually seen as a meaningless buzzword. This is rather disappointing, because we feel that many consumers do not realise that the 'fibre' product they purchased is being limited due to having been provisioned over copper. Whilst most IT & coms professionals do comprehend that VDSL uses copper between the green cab and home, there is a substantial portion of consumers who think it means they get fibre all the way to their home. The UK appears to be alone in advertising VDSL/FTTC as 'fibre broadband' when it really isn't. - See Fibre Optic Broadband which isn't! Re: High Court rules in favour of ASA for use of fibre in advertising. I know I’ll be in a minority, but I agree with ASA. Sure, there will be poeple who think “Fibre broadband” means fibre to the home. But does it really matter whether they understand the difference, as long as FTTC has improved their speeds by an order of magnitude, and they are happy? I suspect an even larger proportion of consumers think that the GPS satellites have supercomputers on board that track their every move and beam navigation instructions, “turn right”, “turn left”, to their Sat Navs. But again, does it matter whether they know how it works, as long as it works? And should we ban the advertising of Satellite Navigation devices, just because the Sats don’t really do navving? But repeat apols, I know I am in the minority on these forums. I am lost for words. Very bad from the ASA. They need to specify a way for FTTP to be differentiated as it is clearly a different and superior technology to hybrid copper/fibre. I wonder if we should start a campaign, as its a numbers game, and I expect with a flood of complaints that are organised together, they may take another view, I am not sure if I am motivated tho. But would do it if others were interested as well. 7LM, of course it matters, you basically saying you condone misleading advertising, and not to mention this has a bearing on the business case for FTTP, the business case is not as good if your competitors are allowed to describe their copper based broadband as the same technology. It is a bit like ford been told they can pretend they have ferrari engines in their cars. I was going to say they have just ruled with the status quo, you have BT, VM etc all using fibre, and I expect that was a large factor, but at the same time I do know the ASA in the past have ruled against the status quo, including a complaint I did against VM, so I dont know on this one. Be careful what you wish for. Look at how speeds are now advertised as “averages”. So despite the fact that I want, and achieve, something around 28/8, I have to buy a product that advertises itself as 35/6. “Fibre” is not at all misleading in FTTC. The product I currently use is FTTC, the ‘F’ of which stands for ‘Fibre’. Whilst I of course understand the differences between the various FTTx acronyms, when in conversation with my non-techie neighbour who is still on ADSL, and who would quickly become bored if I were to explain every ‘x’ in all the FTTx variants, I would simply describe my own service as “Fibre broadband”. There is a fundamental difference between his technology and mine, and that difference is the presence of Fibre in the product I pay for. There is a fundamental difference between his technology and mine, and that difference is the presence of Fibre in the product I pay for. While I agree it can seem a little pedantic I have to disagree with this statement. Should all 21CN ADSL2+ lines be called fibre? Should LLU lines have been called fibre? They have fibre going to the exchange and so in the product you are paying for. Your neighbours technology is DSL over copper and so is yours, just because they moved the DSLAM a little closer doesn't make a difference. Why should ISPs who are actually providing fibre to you have to compete in the marketing world (think your less savvy neighbour) with companies calling inferior products "fibre"? If only there had been separate names given to the various versions of DSL that denoted the possible speeds? ADSL, ADSL2, VDSL maybe? Surely this is madness. Try another way of looking at it, considering the other FTTx acronyms. For many people, FTTdp would provide all that they will ever need, in terms of speed. It would be well worth differentiating it from copper, but would we bar from calling it Fibre, simply because FTTP has more fibre than FTTdp? And what about further fibre extension, beyond FTTP, such as FTTR (Router). Most ISP packages include a router, so would we have a retrospective ban on use of "Fibre" to describe FTTP, simply because FTTR goes even further? I am all in favour of educating Joe Public as to the differences between various copper options, and FTTx options. I would like Joe to know that FTTP is faster than FTTC, but has downsides for telephony (voice) applications. But if Joe simply doesn't care as long as we can phone his pals and stream Nertflix, let's not confuse everybody else by banning the use of words that form part of accurate descriptions. The F stands for "Fibre" in all of the FTTx cases. I disagree with 7LM whilst appreciating his point. If you go down the line of ‘what makes people happy’ then they could be happy yet misled and that is not what is meant when determining the truthfulness of advertising. Taking 7lm’s point less literally and substituting ‘what matters to people in practice’ I deny that FTTC is ‘fibre’ because fibre means "fast"’. Fibre internet connections are not just different because they are faster, they are reliable and predictable, free from maintenance problems, lighting strike, GPR/EPR, interference, crosstalk and unpredictable speed droop caused by it. The difference is absolutely like night and day, it’s not just speed and if people might think that the two are the same then it’s a symptom of both their ignorance and the fact that they must not continue to be misled. And much love to 7lm, and I really do appreciate your point. Appreciate the sentiment. I know I'm in a minority (of 1?) and so shall try to stop labouring that point. Say your neighbour person has just moved into an urban area when FTTP is available (or one of the few rural ones), they shop around for a new broadband connection. 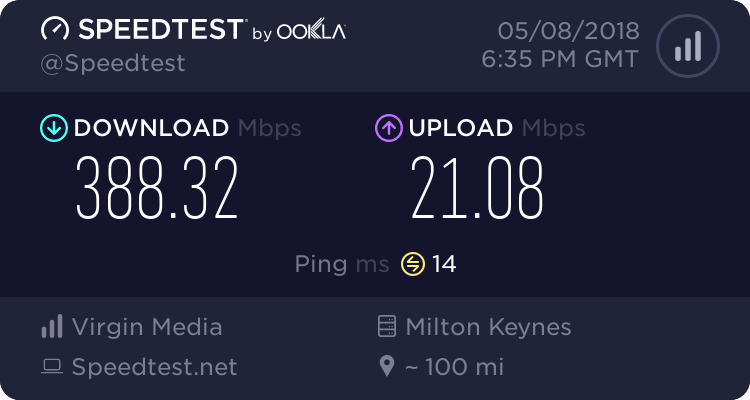 "Well Cityfibre have speeds that looks fast, but its expensive and I'm not really sure what those numbers mean, I saw an advert on TV that said Sky did fibre and its included with the channels package. I'm not a mug, why would I pay so much for just broadband when its the same!" As for the FTTdp or FTTpole, I can only borrow from Weavers (excellent) answer and say that yes you are still not buying "fibre" because you still have a length of noisy copper carrying DSL signals from there to your house. I have 15m ethernet cables that wont do gigabit because their shielding has worn off and the pairs have untwisted. How do you think 20m of telegraph wire from the pole will fare carrying that. What happens when a close neighbour buys an unfiltered chinese power supply... its just not the same technology as a fibre onto your property. Fully aware of the futility of this argument as I'm sure we'd agree on most things 7LM, but its fun to discuss anyway! With that reasoning they can start selling ADSL as FTTE (fibre to the exchange). Just call fibre fibre and copper copper. It's not fibre broadband if you only have a copper phone line. I just wish that more users were aware of the practical advantages, which are so enormous. Mind you, I do have a lot of copper, 7300m of it (although I’m not sure what OR’s kit measured, it would be good to know). I also agree that the ASA has got it wrong, if its not fibre to the property it shouldn't be called fibre. Why and how has the court got this so wrong? The UK is afaik the only country that does use the word fibre inappropriately. If you speak to someone in the US or Oz then they use the terms DSL or cable. Even my 80 y/o uncle in Australia uses the term DSL, so it was natural progression for them to start using the term VDSL to denote the possibility of higher speeds. Where we went wrong in this country is ASA allowing VM to use it way back in 2007 despite complaints by BT et al. If it had been stamped upon back in 2007, then BT/Openreach wouldn't be able to use it now. It is interesting that they said that it was ruled the word fibre is seen as a "meaningless buzzword". But that is because ASA allowed it to turn into something meaningless. ASA are hardly likely to want to admit they made a mistake 12 years ago. Whilst I get what 7LM is saying, the fact remains if it had been nipped in the bud, then his neighbour would be quite happy saying he had VDSL and know what it meant - just like people in other countries do. Anyone who drives knows there is a difference between petrol and diesel. They don't need to know the intricacies and mechanics of the engine. If we in the UK had done it right from the start, then the general public here would have soon learn that there is a difference and be happy to use the correct terminology.